Devin loves black rice (sometimes called Forbidden Rice). He found it at Whole Foods a few months back. 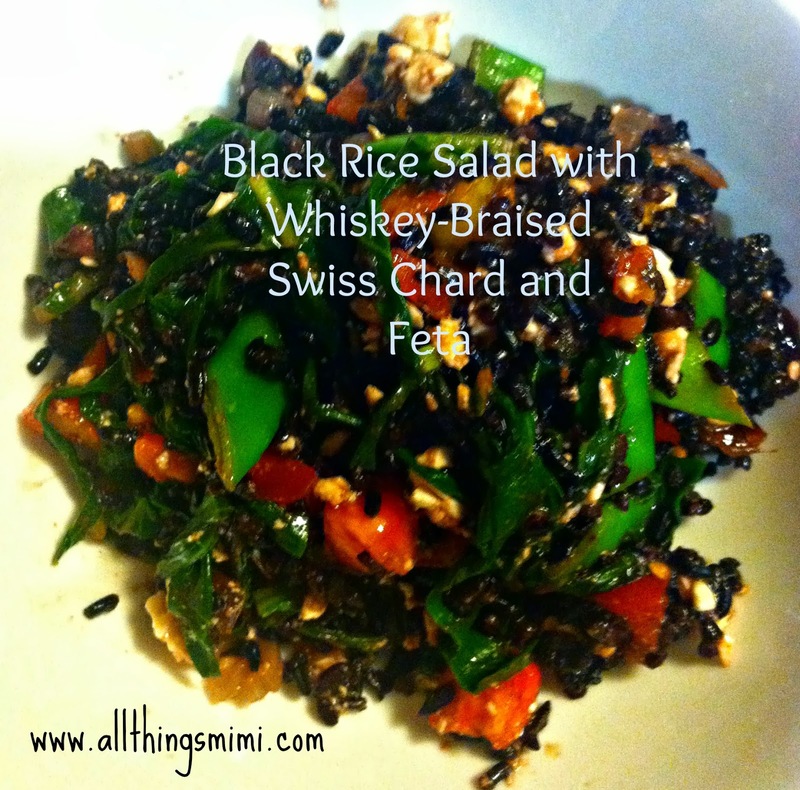 To me, it has the texture of wild rice, but is much sweeter. I have used it the same way I would use regular or brown rice. I usually make it in my rice steamer, using the same 2:1 liquid to rice ratio, but adding a little extra liquid to make sure it gets done. It is definitely toothier than white rice, though, so don't be expecting soft rice. I cooked about a cup and a half of black rice in my rice steamer, using half chicken broth, half water as the liquid. During the last 10 minutes or so of its cooking time, I went out and grabbed a few handfuls of swiss chard from the garden and chopped it into strips (I usually chop off the long stems, roll the leaves up and cut them- like a chiffonade). I put on my skillet and used a little olive oil and a little bacon drippins, then chopped up a clove of garlic and 2 shallots. I don't turn on the heat until the fat and aromatics are in the skillet- that way as the fat renders, it picks up the flavors of the garlic and shallot. When that was sizzling, I added the swiss chard, then a few glugs of whiskey. I threw in a few dried cranberries, then turned up the heat a bit and let it wilt down. It probably took about 10 minutes. I roughly chopped about a cup of sugar snap peas and threw them in to get warmed up, and then let it go about another 3 minutes. When the rice was done I put it in a large bowl, then added the chopped tomatoes and crumbled feta (about a cup), and dumped in the swiss chard mixture. I dressed it with a little balsamic vinaigrette to bring out the sweetness of the rice. I served it warm- but I packed the leftovers to take for lunch tomorrow- I'll probably eat it without warming it up. I'm sure the flavors will have festered and it will be twice as good tomorrow!